1. Displays ：11sets, 4digits, 25mm character height red LED display. 3. Alert function：built-in buzzer alert device automatically sounds alarm when values exceed pre-set threshold value. 4. Power-saving & backup：in intelligent power saving mode, panel works for more than 24 hrs with built-in battery during AC power failure. 5. 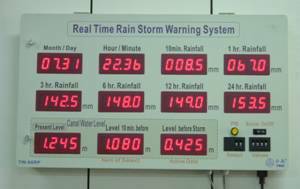 Data logger：built-in 512k Flash memory store rainfall data for 420 days( 5min/per). 6. Dimensions：650x350x60mm, wall hanging weatherproof coated aluminum frame. not affected by temperature, water quality or foam. Digital output not fluctuating if water level stays the same.